Currently, there is no long term parking available for the UPMC Hamot parking garages. We apologize for the inconvenience. Contractor Permits are available now, the price has changed, click here for details. The Erie Parking Authority is a Municipal Authority whose purpose is to provide parking to the citizens of the City of Erie at a fair rate and in a safe and convenient environment. Our intent is to supervise, operate, and administer an efficient, coordinated system of both on-street regulated parking and off-street facilities as needed to develop and maintain the integrity of the City of Erie. Incorporated in 1951, the Authority is governed by a 5 member Board appointed by the Mayor of the City of Erie. Board members serve five year terms and are not compensated. The Board meets twelve times a year on the second Tuesday of each month at 8:30 a.m. in the Parking Authority’s Main Office. The Authority facilities consist of nine (9) parking garages totaling 4,449 spaces and seven (7) surface lots with 503 spaces. With respect to on street parking, the Authority manages 1,400 metered spaces. We excited to announce our new mobile parking app for city of Erie parkers called meterEZ (pronounced Meter Easy). This convenient app allows users to pay for parking at any meter in the city. Add your credit card info and your car details and you are set. When your parking time is about to expire you will receive alerts and will be given the option to add more time. We are very excited to be offering this and encourage everyone to download the app today! 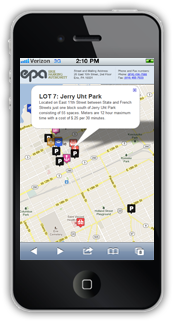 Visit our site from any mobile device to find parking options.